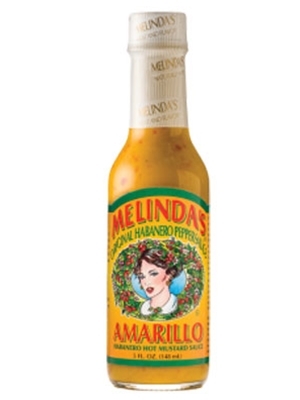 Melinda's Amarillo Habanero Hot Mustard Sauce is a hot mustard pepper sauce offering a classic West Indies taste that adds flavorful heat to your food. The mustard-base harmonizes with sandwiches, burgers and hot dogs with precise clarity. Try it in potato salad or as a salad dressing. Add some honey and make a delicious sweet-hot dip for eggrolls or a great basting sauce. Add it to your B.B.Q sauce, its most perfect use. Fresh onions, habanero peppers, food starch, mustard, sugar, salt, vinegar, flour, tumeric.